I am excited to be part of the Hay House Blogger Community and bring you book reviews. If you choose to read these books, I’d love to hear your thoughts in the Comment area below. 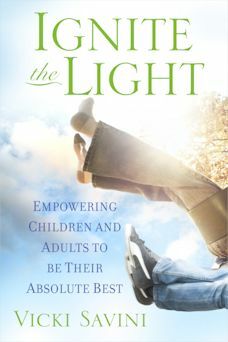 Ignite The Light, by Vicki Savini (a public school teacher and life coach), is a must-have resource for all parents, teachers and those who work with children. It is a “how to” book like no other – how to help our children be mindful, thoughtful, positive, self-loving, and self-knowing individuals. It is stepping stone toward a society that educates our youth in a new and valuable way. The book is for adults to learn the content first for themselves so they can then integrate it into their interactions with their children; therein teaching their children and giving them life skills. Savini reminds us “our children are mirrors for whatever we’re experiencing in life” and they learn from us through not only words and actions, but our energy — we model behavior and they pick up on that. This sets the stage for Savini educating us about how we can overcome our own limiting beliefs, become mindful of our thoughts and actions, and how, through our daily interactions, we can simply and effectively give children these and other essential-self skills; skills the average school education unfortunately does not provide. She provides clear and concise ways we can cut through and address the negative influences that stayed with us from our upbringing so we can come to our children, clearly and mindfully. She outlines 7 essential tools toward loving yourself, feeling your feelings, quieting the mind, tuning in, removing toxic thoughts, speaking your truth and plugging in. Points I found particularly important were responding vs reacting to situations, acting out of love not fear, and finding the answers within ourselves and not looking outside ourselves. As a mom and a life coach myself I have been waiting for a book like this! I am always amazed how our public school systems (and most private) do not teach these cognitive practices. While the tools she touches on include mindfulness, yoga and meditation, she addresses how these can be incorporated into the classroom and daily living in a way that is more conventional and appealing to conservative classrooms and families. As a public grade school teacher, Savini has applied these approaches in her own classroom and talks about how they can be integrated naturally. Savini offers the essentials for taking parenting and teaching to the next level. Ignite the Light is a catalyst to help our youth to shine brighter than ever. — not for scholastic or material achievement, but for themselves. FTC Disclosure – I was not financially compensated for this post. I received the book from Hay House for review purposes. The opinions are completely my own based on my experience. My BTW Disclosure – I want to let you know that the links to products I provide in my book reviews are not aligned with any affiliate program in which I may be participating at the time of the review because doing so just doesn’t feel right to me. I am honored Hay House provides these books to me to review. My intention is to link you to a site that provides the lowest cost I have encountered at the time I publish this review, as well as to a site from which I have purchased products and had a good customer experience.